Students who minor in gerontology learn the skills essential for participation in the growing field of aging. Career paths include, but are not limited to, public policy, social services, health care, housing, recreation, transportation, business and education. A minor in gerontology complements majors such as nursing, social work, community health, counseling, psychology, sociology, communication sciences & disorders, community development, communication studies and business. As a gerontology minor, you will receive personalized attention from nationally recognized faculty and experience unique learning opportunities in both the classroom and the community. 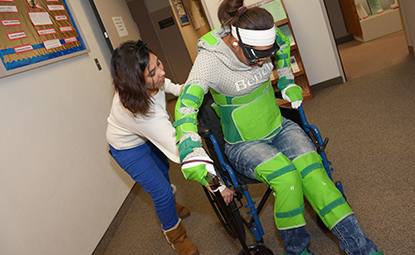 State-of-the-art experiential learning equipment including age-simulation suits, vision impairment goggles, and empathy lungs designed to enhance understanding of the physical, social, and cognitive changes that may accompany the diverse experiences of aging.